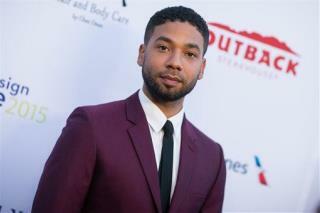 (Newser) – After being released on bond Thursday, Jussie Smollett quickly returned to the set of Empire, sources tell the Hollywood Reporter. Fox officials released a statement after Smollett's arrest that they were "evaluating the situation and ... considering our options," and sources say those options include keeping Smollett's character in the script for the season five finale or writing him out of it. The drama series is currently filming the penultimate episode of season five, and sources tell TMZ Smollett was shooting scenes for that episode Thursday. Those sources also say the actor begged the cast and crew to believe that he did not fake an attack on himself Jan. 29, as he is charged with doing. "I’m sorry I’ve put you all through this and not answered any calls," he reportedly said. "You know me, I would never do this to any of you, you are my family. I swear to God, I did not do this." Now he got more than the publicity he's seeking.